The enigma of spontaneous human combustion (SHC) is considered the most bizarre and frightening of all the phenomena in the world of the unexplained and the unknown. SHC is a purported phenomenon in which a human body bursts into flames as a result of heat generated internally by some form of chemical or energetic reaction. The flames begin within the victim's own body and are very complete in their work, reducing their human fuel to a pile of ashes in minutes -- sometimes seconds. The whole event is so quick and selective that objects near the victim show only minor heat damage. Over the years there have been many theories as to the cause of spontaneous human combustion, but most can be explained by some outside source or chemical reaction, of which did not originate inside the body, as is claimed. * Alcoholism - many Spontaneous Human Combustion victims have been alcoholics. But experiments in the 19th century demonstrated that flesh impregnated with alcohol does not burn with the intense heat associated with Spontaneous Human Combustion. * Devine Intervention - Centuries ago people felt that the explosion was a sign from God of divine punishment. * Deposits of flammable body fat - Many victims have been overweight - yet others have been skinny. * Build-up of static electricity - no known form of electrostatic discharge could cause a human to burst into flames. * Electrical fields that exist within the human body might be capable of 'short circuiting' somehow, that some sort of atomic chain reaction could generate tremendous internal heat. * An explosive combination of chemicals can form in the digestive system - due to poor diet. The first reliable historic evidence of Spontaneous Human Combustion appears to be from the year 1673, when Frenchman Jonas Dupont published a collection of Spontaneous Human Combustion cases and studies entitled ‘De Incendiis Corporis Humani Spontaneis'. Dupont was inspired to write this book after encountering records of the Nicole Millet case, in which a man was acquitted of the murder of his wife when the court was convinced that she had been killed by spontaneous combustion. Millet, a hard-drinking Parisian was found reduced to ashes in his straw bed, leaving just his skull and finger bones. The straw matting was only lightly damaged. Dupont's book on this strange subject brought it out of the realm of folkloric rumor and into the popular public imagination. 62 year old Mary Reeser is considered one of the most famous cases of SHC. 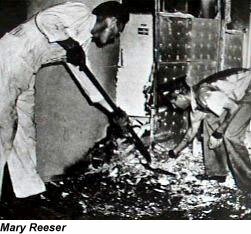 On July 2nd 1951, her smoldering remains were found by a neighbor and some house painters. She had been sitting in an easy chair when the incident happened. Her left foot still wearing a slipper remained intact and only the corner of the room and the chair she was sitting in had been burnt. The apartment's walls were covered with a greasy substance. Firemen, police and pathologists examined Mrs. Reeser's remains and also found her liver which was fused to a lump of vertebrae and her skull which had been shrunk to the size of a baseball by the unusually intense heat. * On Dec 5, 1966, Dr. J. Irving Bentley's remains were found by a meter reader in the bathroom. All that was left were ashes and the left leg and foot. A hole in the floor was the fire's only evidence. The remainder of the house was intact. * In October 1938, Maybelle Andrews was dancing at a nightclub. Suddenly mysterious flames erupted from her shoulders, back and chest. Her boyfriend said that they came from her body and there were no other fires in the room. 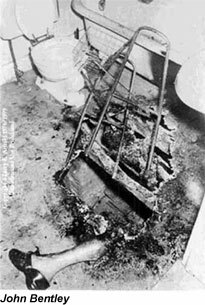 -On May 18, 1957, Anna Martin, 68, of West Philadelphia, Pennsylvania, was found incinerated, leaving only her shoes and a portion of her torso. The medical examiner estimated that temperatures must have reached 1,700 to 2,000 degrees, yet newspapers two feet away were found intact. * On January 31 1959, 72-year-old Jack Larber, a patient at the Laguna Honda Home in San Francisco, had his clothing mysteriously catch fire a few minutes after being fed, while his attendent was out of the room. Said attendent put out the fire with blankets immediately, but Larber died on February 2 of third-degree burns. Larber was a non-smoker; no explanation was ever found for how the fire started. * John O'Connor was found dead in his living room by the community nurse who regularly visited him. His remains were in a chair. Only his head, upper torso and feet remained untouched. There was little smoke damage to the room and furniture. * Jean Lucille Saffin. a 61-year-old mentally handicapped woman burst into flames in her kitchen. It is said that her father, who was seated at a nearby table, saw a flash of light out of the corner of his eye and turned ... to find that she was enveloped in flames, mainly around her face and hands. The fire was put out with water by Mr. Saffin and his son-in-law. No cause of the fire was found. * In October 1980, Jenna Winchester burst into flames while sitting in a car next to a friend who saw yellow flames coming from her and heard her scream for help. Jenna survived the experience with 20% of her body being burned.